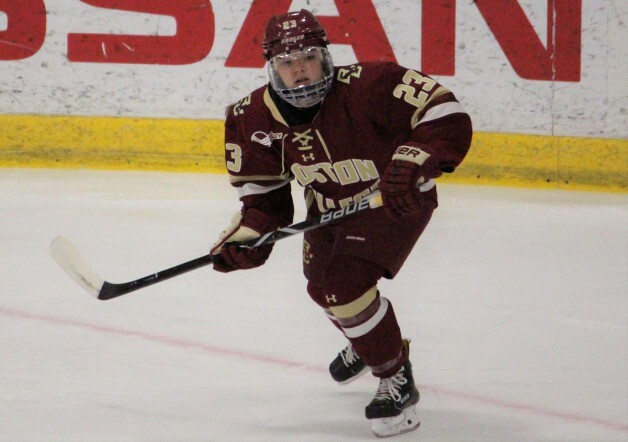 Boston College women’s hockey freshman Cayla Barnes has been called up to join the 2017-18 U.S. Women’s National Team in its preparations for the 2018 Olympic Winter Games in PyeongChang, South Korea, in February. Barnes, an 18-year-old from Eastvale, will meet up with the team in the Tampa area this weekend and begin practicing with the team as it preps for the 2017 Four Nations Cup, which is set to start on Tuesday, Nov. 7. She has withdrawn from Boston College and will return in August 2018 to re-start her freshman year, both academically and athletically. So far this season, Barnes appeared in all five of BC’s games. Barnes becomes the youngest member of the 2017-18 U.S. Women’s National Team. She made her full national team debut in December 2016 at age 17 as part of the U.S.-Canada Series. She is also the only player in history to win three gold medals at the IIHF Women’s Under-18 World Championships, helping lead the U.S. to first-place finishes in 2015, 2016 and 2017. She was the captain of the U18s in 2017 and earned the Directorate Award as best defenseman in both 2016 and 2017.